Left Behind in Rosedale is a stunning analysis of community and neighborhood decline. Through creative application of ethnographic analysis, participant observation, and in-depth interviews, Scott Cummings' unique book breathes human life into one of the most serious problems facing the nation's cities: the ghettoization of urban neighborhoods. Transcending demographic and statistical analysis, he vividly and passionately tells the story of ghettoization by explaining what happens to people's lives during the process of racial transition and change.Cummings takes the reader on a distressing historical journey, detailing the progressive decline of one community's culture. Along the way, he explains and explores the futile attempts of its white elderly residents to maintain their traditional way of life. He then moves to an examination of the black youth who victimize the elderly and explains the family and gang context of their actions. Moving full circle some fifteen years later, after the collapse of Rosedale is nearly complete, Cummings documents the similar plight facing the black elderly and details the grinding poverty that has enveloped the entire community. 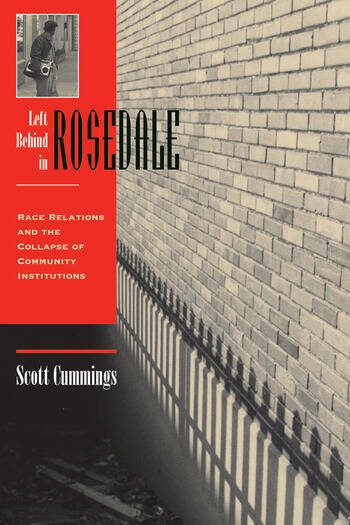 He concludes by evaluating the community's effort to revitalize itself and explains why these efforts failed.Cummings uses the case of Rosedale as a window to explore and critically evaluate the evolution of American urban policy over the past forty years. He concludes that many of our efforts to solve urban problems have actually made them worse. This book should be read by liberals and conservatives alike, neighborhood and community activists, politicians and reformers, urban planners of American cities, and citizens who want to know why government efforts to revitalize urban neighborhoods have accomplished so little.